I have seen repetitive (stereotypic) behaviours many times in animals in zoos and circuses, and I have been distressed and angered by it, but I remember clearly the first time I felt the sensation of being ‘chilled to the bone’. It was in 2010 and I had been to investigate a circus performing not far from where I lived. I usually shut my emotions in a box when I’m in the audience, trying to look as if I am enjoying myself while mentally taking note of the behaviour of the animals and the handlers. I could never supress the shame I felt though, being part of those looking on while these subjugated animals were made to perform for us. There were three elephants in the act that evening – and it all seemed so pointless. They walked round the ring in one direction, then another. They put their front feet on stools, they pirouetted on the spot and then walked out. Their giant presence made the audience gasp when they walked in, but I had heard the same gasp of amazement at a visit to the Chinese State Circus when a snake-like dragon puppet entered the ring. The puppet was enormous – brought to sinuous life by the skill of several people inside. The whole audience seemed transfixed by the spectacle. It simply isn’t necessary to subject a wild animal to a living nightmare to make an impact. After the performance had ended, I paid my £1.50 to visit the ‘zoo’. And there were the three elephants. They were shackled to a wooden board by all four legs, the chains disguised with a mound of straw. They were stereotypically half-weaving, half-bobbing their heads, all in perfect unison. The rhythm didn’t falter. I can feel my skin crawl just remembering it. I think it was the synchronicity of their weaving, so appallingly abnormal, that I found chilling. Wild animals in circuses suffer in so many ways – whether it is a camel almost permanently tethered, or a tiger pacing a tiny, so-called ‘exercise cage’, or an elephant in the ring being jabbed by a bullhook, the sharp point concealed by brightly coloured streamers. Thankfully, this suffering shows signs of coming to an end. 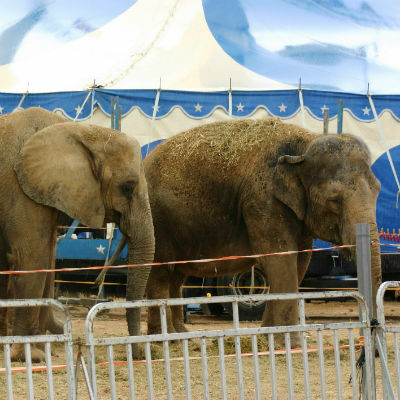 Globally, over 40 countries have introduced forms of prohibition on animals in circuses. Here in Britain, Scotland banned wild animals in travelling circuses in December 2017 and in England, the long-promised ban is supposed to be in force by 19th January 2020, when the current regulations licensing circuses comes to an end. We can help with another potential ban. Wales has launched a public consultation on a proposal to ban wild animals in travelling circuses – and the consultation ends on 26th November 2018. You don’t have to live in Wales, or even in the UK, to take part, and you can do so by signing onto our pre-written letter here. But it is the response of individuals that has tipped the balance in favour of the animals. Every letter or email to a decision-maker; every signature on a petition; every response of compassion to a survey; every person who decided not to take their child to a circus has, cumulatively, sent a clear message to local and national governments that their potential voters want those with authority to act on our behalf and say no to using and abusing animals in this way. Let’s send an equally strong message to the Welsh government, and to those still using animal acts, that such performances must be consigned to history.